The thin liquid found inside of a green coconut is called coconut water and should not be confused with coconut milk obtained by grinding up coconut meat. Coconut water is packed with essential nutrients and serves as an emergency saline drip to replenish lost minerals. You can also include in your routine to beat the heat and replenish any lost energy during the summer season. But, many people have questions about it and want to know the connection between coconut water and diabetes. Should diabetics include it in their diet? Let's find out now! Yes, you can drink coconut water even if you are a diabetic. The only thing you need to bear in mind is that coconut water does contain fructose. Only 15% of the sugar breakdown in coconut water is fructose – it also contains sucrose (35%) and glucose (50%). You should drink it only when your blood sugar level is properly managed. By including it in your diet, you will enjoy a number of impressive benefits. People with diabetes may have to deal with many issues, including kidney failure, numbness in the feet, and even vision loss. These issues are usually associated with improper blood circulation, and that is when coconut water can help. It improves the circulation of blood within the body by dilating your blood vessels. It also proves beneficial in preventing and combating atherosclerosis. To avoid dealing with complications associated with diabetes, it is important to keep your body weight in check. Coconut water is again a good choice because it makes you feel full and prevents overeating. It also contains salts, minerals, and good fat without any cholesterol. That is why coconut water and diabetes have a positive connection. Coconut water has certain properties that boost your metabolism. An increase in metabolic rate means your body can now burn sugar faster and leave you with more energy. It also helps burn the insulin and keep your blood sugar levels in check. Drinking a glass of coconut water twice a week will help enjoy this benefit. When you have diabetes, you do not just have to keep an eye on your sugar intake. It is equally important to consider your carb intake. Carbs are the richest sources of sugar and can lead to a spike in the levels of glucose in your blood. Coconut water contains less carbs and provides you with fiber as well to improve digestion of whatever you eat. It is also safe to include coconut water in your diet because it is low on glycemic index. With a glycemic load of 3, it does not lead to quick spike in your blood sugar level. Moreover, it improves insulin sensitivity mainly because of the presence of magnesium. This also helps keep blood sugar in control. Although coconut water is very beneficial, you should never make it a daily indulgence. You may want to talk to your doctor before adding coconut water in your diet. Moreover, you may want to avoid drinking it if you have diabetes and have a chronic kidney condition as well. 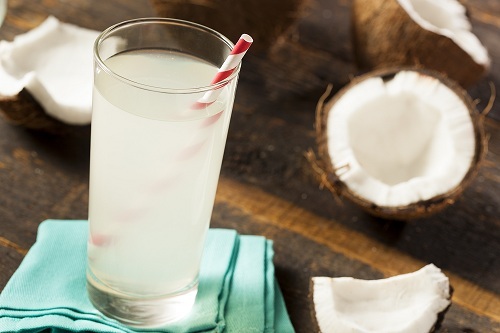 To understand the connection between coconut water and diabetes, it is important to develop a better understanding of nutritional facts of coconut water. Depending on its size and type, you usually get anywhere between 200 ml and 1000 ml of water from a coconut. As compared to a sports drink, coconut water contains more potassium and less sodium with fewer calories. An ounce of unflavored coconut water may provide you up to 1.3 g of sugar, 5.45 calories, 5.45 mg of sodium, and about 61 mg of potassium. The same serving size of Gatorade provides you with 1.75 g of sugar, 6.25 calories, 13.75 mg of sodium, and 3.75 mg of potassium. Keep in mind that it will have a slightly bitter taste if it is younger than five months. However, you may not get enough water from mature coconuts but you will get more of white edible meat from them. What Else Can Diabetics Drink? Coconut water and diabetes enjoy a positive connection, but you can also drink other stuff without hurting your blood sugar levels. Drink as much water as you can when you are dealing with type 2 diabetes. You can cut down on calories by drinking at least 16 oz. of water before each meal. Try to drink at least 8 oz. of water eight times a day, and more if you do some physical activities as well. Squeeze a lemon into a glass of water to make it taste better. While it is important to keep an eye on how many carbs and calories you consume, skimmed milk is still a great source of all essential nutrients. It provides you with vitamin D and calcium and helps keep your bones strong. You get about 80 calories and 12 g of carbs from an 8 oz. cup of skim milk, so be sure to limit your serving size when going for milk. You can enjoy juice in moderation even when you have diabetes. Eating whole fruits and vegetables is still a better choice because of the amount of fiber you get, but you can include juices in your diet so long as they do not contain any added sugar. About 4-6 ounces of most fruit juices provide you with 50 calories and 15 g of carbs, so drink in moderation. Loaded with antioxidants, unsweetened tea helps eliminate free radicals from your body and improves your defense against different diseases. Green tea and coffee may help prevent Type 2 diabetes in the first place.